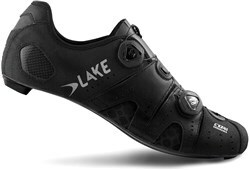 The Lake CX402 road cycling shoes are pro level. The best materials are used such as Klite Kangaroo leather on the upper and a Custom Fit Carbon Fiber sole for pedalling performance. Kangaroo leather is strong, more supple and durable than cow hide. Dual sided Boa lacing gives you micro levels of adjustment to get the best possible fit. 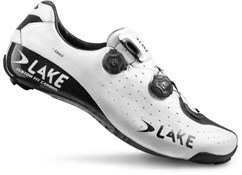 Lake's CX402 road shoes are manufactured using the CFC Race Last. This last is specifically shaped for optimal power transfer. 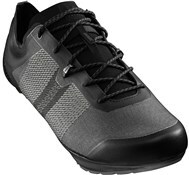 Outsole: Custom Fit Carbon Fiber sole. 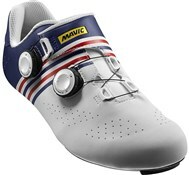 Men's regular with available in a 3-hole or Speedplay specific cleat pattern for use without adapters. Replaceable heel strike pad. Closure: Dual Side mounted Push/Pull Boa lacing system with releasable lace guides.